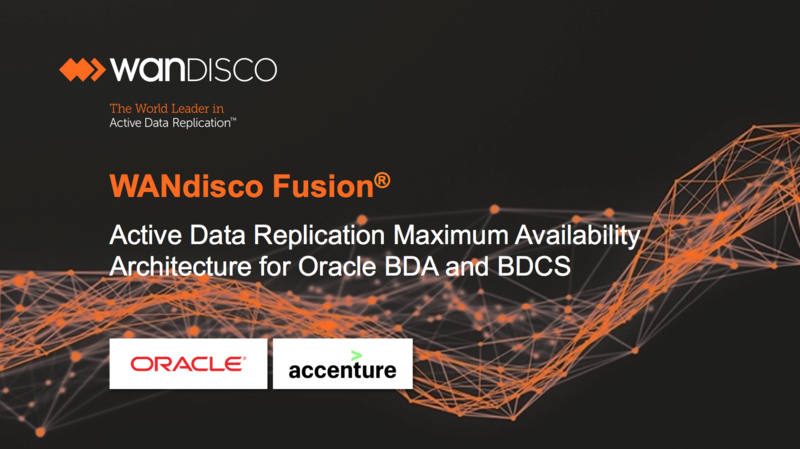 Achieve high availability with WANdisco Fusion installed on Oracle BDA and Oracle Big Data Cloud Service environments. Meet Enterprise SLA with automated recovery after planned or unplanned network or hardware outages. Near-real time data consistency is provided across clusters. Leverage Oracle Cloud elasticity to operate in parallel during migrations or upgrades, allowing data, applications and users continuity without disrupting normal operations. Unlock and leverage idle backup systems for active use in running your business. Transfer data to Oracle Cloud as it changes in on-premises file systems, Hadoop clusters or other cloud environments with guaranteed consistency. Continuous active migration eliminates WAN traffic spikes and allows high volume data transfer to keep up with on-premises ingest rates. What is Oracle Big Data? Oracle (NASDAQ: ORCL) is the world’s largest business software company. Oracle Big Data Cloud Service (BDCS) is an automated service that leverages the power of the Oracle Big Data Appliance (BDA) platform to create fully configured dedicated Hadoop clusters on demand. BDCS runs a wide variety of enterprise big data workloads and technologies while simplifying operations. Oracle BDA is a high-performance, secure platform for running diverse workloads on Hadoop.